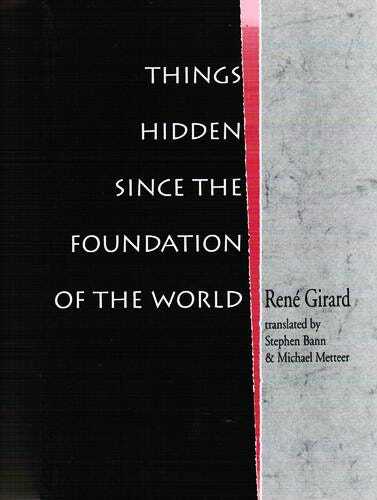 Thiel has previously said that the contemporary French philosopher René Girard has had a tremendous impact on his life, and he told author and investor Tim Ferriss that he considers “Things Hidden Since The Foundation of the World” to be Girard’s masterpiece. Girard’s main concept is “mimetic theory,” which states that most of human behaviour is based upon imitation. The imitation of desires leads to conflict, and when a buildup of conflict threatens to destroy all involved, they use a scapegoat to return to balance. Much of Girard’s work delves into Christian theology, which has also had a profound effect on Thiel. We had a chance to ask Thiel how his favourite Girard work has shaped his worldview, career, and even his faith. Here’s what he said. Business Insider: When did you first read “Things Hidden Since the Foundation of the World“? Has your interpretation of Girard’s philosophy changed as you’ve gotten older? Peter Thiel: I first read “Things Hidden” when I was an undergraduate at Stanford. Girard ranges over everything: every book, every myth, every culture — and he always argues boldly. That made him stand out against the rest of academia, which was and still is divided between two approaches: specialised research on trivial questions and grandiose but nihilistic claims that knowledge is impossible. “Things Hidden Since the Foundation of the World” is an intimidating book. Girard warns on the very first page that he has “deliberately left out all concessions to the reader.” However hard it seems at first, Girard’s philosophy always stresses a few key points. Simplest of all is the idea that imitation is at the root of all behaviour. I’ve noticed that it takes a long time to really sink in. You can understand what his words mean as philosophical concepts without understanding how those concepts play out in life. It’s hardest of all to see how they apply to yourself. I would say that there is no difference in my interpretation of Girard at the level of ideas, but now I have a better sense of how deep his ideas go. BI: You’ve mentioned that you are conscious of your desire to not become distracted by competition in your pursuits. How much has Girard’s theory of mimetic desire and its negative outcomes influenced this approach? Stanford University Press‘Things Hidden’ has significantly shaped the way Thiel thinks. PT: According to Girard, imitation is inescapable. As a rule, we do what we do just because other people are doing it, too. That’s why we end up competing for the same things: the same schools, the same jobs, the same markets. Economics will tell you that competition dilutes profits, and that’s one big reason to question it. Girard gives at least two more reasons: (1) competitors tend to become obsessed with their rivals at the expense of their substantive goals, and because of that (2) the intensity of competition doesn’t tell you anything about underlying value. People will compete fiercely for things that don’t matter, and once they’re fighting they will fight harder and harder. You might not be able to escape imitation entirely, but if you’re sensitive to the way it drives us then you’re already ahead of most. PT: When the payments company Square came out with its flagship credit card reader, competitors jumped in one after the other to do the same thing with triangles or half-moons instead of squares. That’s the comical example I cite in “Zero to One.” A more dangerous phenomenon is the desire for the same position within a company: startups are small, they move fast, and roles are fluid, so there is lots of potential for conflict. BI: How has Girard’s interpretation of Christianity affected the way you practice your religion? Has your spirituality influenced the ways you’ve decided you would like to leave an impact on humanity? PT: To see the difference Girard makes, consider the Book of Revelation. It’s the last thing in the New Testament. It’s very strange. What could it mean to someone today? There are two common views: Secularists see a bunch of crazy gibberish that should be ignored or mocked. Fundamentalists see an authentic prophecy of divine vengeance. Girard says there is another, deeper answer: The destruction that Revelation describes is real, but we can’t blame it on an angry, violent deity. We have created weapons capable of violence on a biblical scale. In the event of apocalypse, we will be responsible. Blaming the gods for our own violent acts is what humans have done throughout the whole history of religion. But as Girard reads them, the Gospels reveal that God is not violent. He has no need to get into a fight. He is not our rival. What God actually is and what it means to be created in God’s image is not something to capture in a sound bite, but it certainly begins with creation and continues with life. BI: Is there a particular section of “Things Hidden Since the Foundation of the World” that has particularly influenced you or that you suggest readers new to Girard become familiar with? PT: There’s not an easy way into “Things Hidden.” It’s not obscure; it’s just densely packed. The best place to start reading Girard might be with whatever part of culture you’re most interested in, because he’s probably written about it.